by Kasten Marine Design, Inc. The power yacht designs listed below are in several groups that are arranged approximately in order of size, from the largest at 80 feet to the smallest at 8 feet... Please feel free to inquire about any of the designs on this page. For plans prices and ordering information check the Plans List Page for a list of Study Plans and Building Plans. Links to new boat designs are added as new designs are developed, so you may want to bookmark this page and check in periodically. Our newest designs are marked with the symbol so they are easy to find. Have a look at our Prototypes page too, where you'll see a number of concept designs or other new that are currently being developed. The majority of the designs listed below are available as Stock Designs, or are offered at a substantial discount versus the cost of developing a new Custom Design. For each design listed below, there is a link to a web page describing the design in detail. If more information is desired in order to start planning for construction, an Estimating Plans Set additionally includes a Structural Profile and Arrangement plus a complete Vessel Specification and a comprehensive Equipment List, all valuable aids in planning and estimating costs. The intent of the Estimating Plans Set is to provide enough information for any builder to give a firm estimate for construction of the vessel. Building Plans contain all the information actually needed to complete construction of the vessel. If you would like to order Study Drawings, Estimating Plans, or a complete set of Building Plans for any of these designs, please see the Plans List Page for additional detail, a summary of plans prices, and complete ordering information. See our Stock Design Page for a thorough description of what is included in a typical plans package. If you want to know what's involved in creating a Custom Design to suit your specific requirements, you'll find excellent detail on our Custom Design Page. The 53' VALDEMAR shown above was built in aluminum using CNC cutting, and has been finished exquisitely on the interior. Check it out here. North Coast 80 - Pictured above, the North Coast is a modern power yacht for world cruising in style. Twin engines with V-drives are provided in order to maximize interior space below. A Diesel Electric option has also been detailed - a hybrid..! The luxurious interior has a master stateroom on the main deck and several guest cabins below. A second layout offers an even larger master stateroom below. Hull construction is in aluminum. With modifications, steel, wood or fiberglass are also possible. Please see the Plans List Page for a summary of Plan prices. Free Spirit 76 - A trawler yacht having traditional 'Baltic' styling with a classic yacht interior. Twin engines make use of twin controllable pitch propellers. Four staterooms allow a spacious and un-crowded layout for world cruising with an extended family. Hull construction is in aluminum. With modifications, steel, wood or fiberglass are also possible. Please see the Plans List Page for a summary of Plan prices. Chantage 64 - A truly classic motor yacht. Low and sleek like a steamer, even down to the clipper bow and fantail stern... How much more classic can a motor yacht get? This may well be the ideal platform for a long range cruiser / motor-sailor / personal yacht. The interior layout is ample for a couple and friends, and the main deck accommodations are perfect for summer indoor-outdoor living. The finish throughout is the finest available. Study Drawings & Estimating Plans available; please inquire. Swallowtail 60 - A motor sailing yacht designed to carry two in comfort to the far corners of the globe. Derived from the Greatheart / Swallow's Nest series, Swallowtail is the perfect Nomadic Watercraft. Fully capable as a motor yacht, as well as a sailing vessel. For more information, please inquire. Swallow's Nest 60 - Conceived as a true motor sailor combined with a sleek low profile passagemaker, the expedition yacht Swallow's Nest has shaped up admirably to the task. In terms of hull form, the Swallow's Nest is very much in the same family as our Greatheart designs, including the Greatheart 48 and Greatheart 60, each of which makes use of a ketch rig for "get-home" power and for the synergy of motor sailing when conditions favor. In the case of the Swallow's Nest the vessel is fully sail-capable, having sufficient sail area as well as a keel design optimized for good sailing. Hull construction in aluminum. Study Drawings & Estimating Plans available; please inquire. Greatheart 60 - The mission statement for this vessel was to fit the maximum accommodations that can be driven by the legendary Gardner 6 LXB diesel engine within a sleek low profile passagemaker. Yes, the Gardner is still available! As with the Greatheart 48, the Greatheart 60 makes use of a ketch rig for "get-home" power and for the synergy of motor sailing when conditions favor. Hull construction in aluminum. Wood or fiberglass also possible. Please see the Plans List Page for a summary of Plan prices. Valdemar 53 - A two stateroom aluminum trawler-yacht with two cabins below for owners and guests, each having a private head, shower and tub. Additionally, there is a large "pilot berth" in the pilot house, arranged so it can be enclosed to create a third cabin for additional guests. This design is an extension of the Voyager 52 / Vagabond 50 / Vagrant 49 lineage. The aft deck provides a covered outdoor living area. Low house structures allow access throughout the European canal system. Please see the Plans List Page for a summary of Plan prices. Voyager 53 - A classic three stateroom steel trawler-yacht with two equal guest cabins below with private head, shower and tub. This design is an extension of the Vagabond 50 / Vagrant 49 lineage. A big aft deck provides a covered outdoor living area. Low house structures allow access throughout the European canal system. Study Drawings & Estimating Plans available; please inquire. Second Star 53 - A hull type well suited to use as a motor sailor, in this case detailed for use exclusively as a power vessel. The interior is intended for two plus another couple as guests. A large engine room and huge storage capacity... Rounded hull for construction in fiberglass. Deck and house structures are wood framed, with plywood, epoxy and glass sheathing. Highly detailed construction drawings. Please see the Plans List Page for a summary of Plan prices. Vagabond 50 - An all steel trawler-yacht with all primary living spaces above decks. Below, there is a private guest cabin and an office, in addition to the owner's stateroom. Two separate heads, one with a bathtub...! This design is an extension of the Greatheart lineage, but with a plumb stem in order to lengthen the waterline for more hull speed and to extend the interior. Low house structures for access throughout the European canal system. Please see the Plans List Page for a summary of Plan prices. Larger and smaller preliminary motor yacht designs can be found on our Prototypes web page. all of them designed to worldwide standards for safe passage making / voyaging. 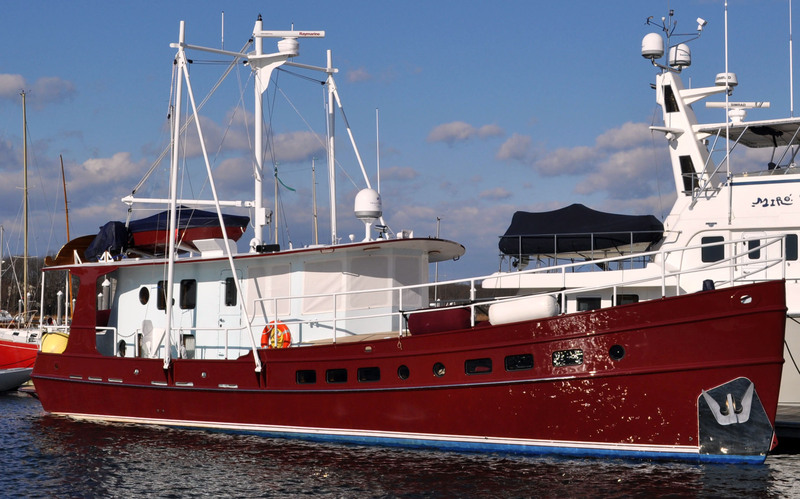 Vagrant 49 - A classic steel trawler-yacht with two equal cabins below, each of which has its own head / shower. A flying bridge provides a second helm station and quite a generous outdoor living area. Low house structures allow access throughout the European canal system, even with the flying bridge. Please see the Plans List Page for a summary of Plan prices. Migrant 49 - Essentially the same as the Vagrant 49 above, having two equal staterooms below, each with private head & shower. For Migrant, we simply deleted the flying bridge... The interior, the structure and the hull form are otherwise identical to the Vagrant 49, above. Study Drawings & Estimating Plans available; please inquire. Ocean Runner 49 - A high class semi-planing yacht designed for dual use as a long range passagemaker or fast cruiser. Two staterooms, raised pilot house, European canal clearance, and just about every luxury imaginable. A number of excellent design images are posted here along with a thorough description of the vessel's particulars. Planned for aluminum construction, but fiberglass also possible. Please see the Plans List Page for a summary of Plan prices. Greatheart 48 - This is a trawler-yacht in the true "Beebe" tradition, but with a true ocean-worthy hull form. Long and lean for efficient passage making. As with the Boojum 43, the Greatheart 48 design goal was to create the largest possible voyaging power vessel able to be driven by the commonly available four cylinder marine diesels. Aluminum, wood or fiberglass. Please see the Plans List Page for a summary of Plan prices. Monsoon 46 / 49 - The practical trawler-yacht. Two versions, both having the same layout, but with slightly different styling. Both have a dedicated engine room, '''midship pilot house, plus an excellent view from the galley! Steel or aluminum construction. Wood or fiberglass also possible. Study Drawings & Estimating Plans available; please inquire. Gulliver 46 - The benefits of an aft house... a very spacious accommodation, privacy, and a striking appearance. Hull construction in steel or aluminum. Wood or fiberglass also possible. Please see the Plans List Page for a summary of Plan prices. Roberta Jean 43 - The RJ 45 is another member of our Moxie family of interior designs (see 'Dream Yachts' below). However in terms of hull form, Roberta is a larger version of the robust all-ocean Buster 30 (below), and very much in the lineage of our Tug-Yacht designs from the 25' Boojum to the 38' Nidaros (see 'Tug Yachts' below). A covered aft deck provides shelter for outdoor lounging and the interior has all the amenities needed for a couple to live aboard for extended periods. Hull structure is optimized for aluminum. Steel, wood or fiberglass also possible. Study Drawings & Estimating Plans available; please inquire. Roberta 43 - Yet another member of the Moxie family of interior designs (see 'Dream Yachts' below). Roberta's hull form of is simply a larger version of our Buster 30 (below), an extension of our Tug-Yacht lineage from the 22.5' Boojum to the 38' Nidaros (see 'Tug Yachts' below). As with Moxie, the covered aft deck provides outdoor living, and the interior is perfect for a couple to live aboard. Roberta's structure is optimized for aluminum, although steel, wood or fiberglass is also possible with attendant design revisions. Study Drawings & Estimating Plans available; please inquire. Coaster 40 - A very roomy family trawler-yacht designed for extreme economy of construction, maintenance and operation. Two private staterooms. A second version is shown as well having a 'widebody' configuration for the galley and saloon area. Hull construction in aluminum. Wood or fiberglass also possible. (Study Plan, Vessel Specification & Equipment List: Please see the Plans List Page for a summary of Plan prices. Molly 36 - Aluminum, steel or wood. The Molly prototype was developed as the smaller sister to the 43' Moxie. Molly has several of the same features of Moxie, but in a more economical size. The ideal canal boat? Very possibly! Please see the Plans List Page for a summary of Plan prices. Greatheart 36 - A pocket trawler-yacht with plenty of space for a small family. Trans Pacific range with a very seaworthy hull. Hull construction in aluminum. Wood or fiberglass also possible. Please see the Plans List Page for a summary of Plan prices. Buster 30 - Robust, rugged, and ocean capable, this little trawler-yacht will be one tough little traveler! 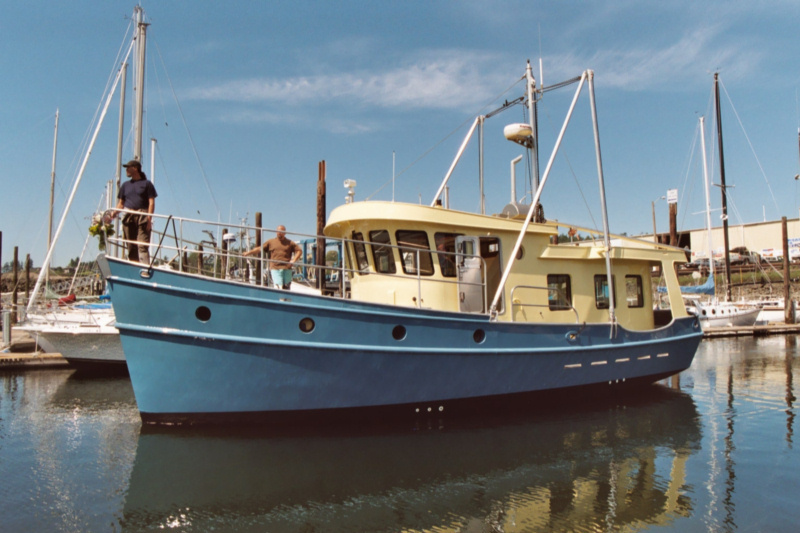 "Buster" is the perfect name for this boat, having a tug-like hull form with fantail stern and plumb bow. Hull construction in aluminum or steel. Wood or fiberglass also possible. Check out the "Pilothouse Online" article about Buster. Please see the Plans List Page for a summary of Plan prices. These are my own favorite kind of motor yachts - designed for simplicity, economy, and style...! that plied the waters from Seattle to Juneau, Alaska. Seaworthy, yet very easily driven. Renegade 50 - Renegade is very nearly the same as the 49' Quinn, and in my view equally ideal... Same layout, with just a bit more headroom, more displacement, slightly greater beam for a bit of extra room inside, and subtly different profile... All other features are identical to the Quinn 49. Hull construction optimized for steel, therefore also aluminum. Wood or fiberglass equally possible. See the Plans List Page for a summary of Plan prices. Quinn 49 - Another member of the Moxie / Renegade family, Quinn is my own ideal type of motor yacht for simple, efficient coastwise cruising. As with Moxie, a classic gracefulness prevails. The covered aft deck is large enough for outdoor living, and the interior has all the amenities required for a couple who wish to live aboard for extended periods. As with Greatheart 48, the intent was to get the largest boat still able to be driven by the commonly available 4 cylinder marine diesels. Hull structure optimized for aluminum. Steel, wood or fiberglass also possible. See the Plans List Page for a summary of Plan prices. Larger and smaller preliminary designs within this series can be found on our Prototypes web page. Nidaros 38 - Every bit a true Tug in her appearance, Nidaros is a larger version of Terrier, having more comfortable accommodations, a larger galley and dining area, plus greater privacy in the owner's stateroom. Hull construction in steel or aluminum. Wood or fiberglass also possible. Please see the Plans List Page for a summary of Plan prices. 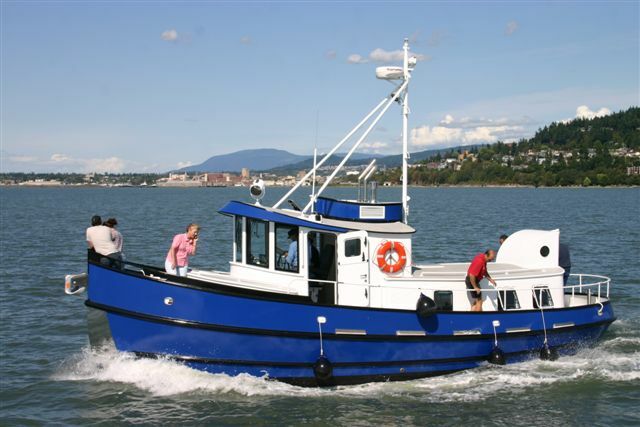 Terrier 32 - The ultimate classic Tug Yacht for family cruising. A true long range voyager designed with economy and simplicity of construction in mind. Hull construction in steel or aluminum. Wood or fiberglass also possible. Please see the Plans List Page for a summary of Plan prices. Boojum 30 - The B-25's big sister... A bit more length for accommodations, and a bit more boat for greater carrying capacity and comfort at sea, but kept to 8.5 feet of beam in order to still be trailerable! Hull construction in aluminum. Wood or fiberglass also possible. Please see the Plans List Page for a summary of Plan prices. Boojum 25 - A very small all-ocean Trawler...! Boojum is a World Cruising Trailerable Tug Yacht. Bilge keels for trailering and for taking the ground gracefully. For more information on the rationale for the keel configuration, check out: Boojum's Bilge Keels. Hull construction in aluminum. Wood or fiberglass also possible. Please see the Plans List Page for a summary of Plan prices. Larger and smaller preliminary 'tug-yacht' designs can be found on our Prototypes web page. A multi-hull is usually given a light and slender hull form in order to gain efficiency to operate on less power and use less fuel. Twee Schoenen 35 (Power Cat) - A tunnel hull aluminum power catamaran, intended as a live-aboard cruiser. Sufficient fuel is provided for long passages at reduced speed. Please see the Plans List Page for a summary of Plan prices. 60' Power Trimaran - Aluminum, plywood or GRP... any of those materials would be suited to this power trimaran. A highly interesting design study having great potential. The original request was for a power tri with "traditional" styling. This is so-far just a concept design which was done to illustrate a vessel type that has considerable merit for long range cruising. Efficient passagemaking in spades... Preliminary design information & Study Drawing available; please inquire. Larger and smaller preliminary multi-hull designs can be found on our Prototypes web page. This series of Pram designs offers the ideal companion to any of our yacht designs...! Why not...? The Pram - The pram hull form has the most carrying ability within the least length. Being flat bottom, these sailing prams take the beach gracefully, and they are easily stowed. Sizes range from 8' to 14' with construction in aluminum, plywood or fiberglass. Please see the Plans List Page for a summary of Plan prices. The perfect companion to any one of our Tug-Yachts, above. A home on the water, plus a tug-yacht to haul it around with...! Drifter 36 - A tunnel-hull fiberglass house boat designed for permanent living aboard. A house-sized stateroom and head. Ample saloon and a galley larger than in many houses. A roof-top garden...! Sufficient power is provided to allow motoring about for yet another waterfront vista... Why not...? Please see our Plans List Page for a summary of Plan prices.